There are many differences between ministering in a large church versus a small church. One big difference is in ministering to children and their families in a small church. Dr. Larry Hipps has worked in large and small churches. He has personally experienced how different it is to minister in a small church. Because he saw smaller churches struggling and wants to help them reach kids for Christ, Larry created the Small Church Kids Ministry Seminar. Hear how he created this seminar to answer the need. “I have been in some area of the Children’s Ministry for the past 40+ years. I have served in all sized churches and have spoken in conferences, seminars, camps, VBS, revivals, and dozens of other meetings all across the US. The two most recent ministries I have been involved with, besides the Bring Them In Ministry I head, is a mega-church in Houston, TX where I was part of the Children’s Ministry team for 15 years and then three years in a small church in Nacogdoches, TX where I was the Family Pastor. (How I got here is an interesting story—I will tell you about it at the seminar.) What I discovered when I went from a church running 4,000 in attendance to one running less than 100 was the ministry in the smaller church was a whole lot harder! I had more work to do at the mega-church but a smaller church ministry presents an entirely different set of challenges. I also discovered that all those training events I had been doing all these years probably were not all that helpful to those attending from smaller churches. It is simply not possible for a church running 100 to really understand how a Kid’s Ministry in a church running 1,000 or more even functions much less how to apply their methods to a smaller church ministry. I realized that I had to come up with a totally new way of thinking about things I had done for years and it worked. Our church slowly started growing, we doubled our Sunday School attendance, more people became involved in ministry, and we started a Bus Ministry. I’m not kidding myself, the church still has a long way to go, but now they are ready to go to the next level. I told you all that so you will know my story. My passion has always been to help churches reach kids for Christ and now I want to help smaller churches reach that next level and take what I have learned and apply it to their ministries. Take a look at the schedule and see if what we have planned will help your church. I think most of it will help your entire church but our emphasis will be on the Children’s Ministry. If you think it can help, bring as many of your people as you can—we have tried to keep the cost as low as possible and still provide quality training. We keep the cost so low to make it possible for you to bring all your workers. This seminar is NOT an infomercial but there will be lots of books, teaching aids, and much more available for your ministry. No matter what area of the Children’s Ministry you work in, there will be something you can use! Proven methods and material you can start using in your ministry right away! To change your ministry, you have to change your thinking – this seminar will help your team get a new vision and understand what needs to be done to get there. So your Children’s Ministry can continue to grow! 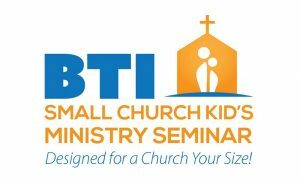 If your church wants to move your Children’s Ministry forward, BTI can help. Don’t wait for a seminar to come to your area. Your church can host the seminar at almost no cost to your budget. We have these seminars in all size churches and the requirements are minimal. Provide a meeting area—fellowship hall, auditorium, or other room large enough for 50 people and 4 or 5 tables. Provide 4 or 5 tables for registration and exhibits. BTI can provide tables if needed. Provide coffee, donuts, juice, snacks, etc. for the check-in time. Make copies of the worksheets for all those attending. Promote the seminar to help us have as many people attend as possible. Pray for God to bless the seminar. That’s it—it’s a simple, top-quality, and cost-effective way to train your Children’s Ministry volunteers. Remember your Children’s Ministry workers would attend at no charge and those outside your church would pay a registration fee. It’s a win-win way for everyone to attend at a low cost to improve their ministries. READY TO MAKE A BIG DIFFERENCE? OR WOULD YOU JUST LIKE MORE INFO ON OUR SMALL CHURCH SEMINARS?